October 2013 – Hurley Books – How do you do? I’ll ‘fess up and declare that my knowledge of Dylan Thomas’s works is poor. I know the first bits of Milk Wood and of course Do Not Go Gentle but that is pretty much it and so I waited eagerly for my e-mail to see what randomly generated line I might get. Of course I secretly hoped for Bible Black and then feared getting it. In fact who could possibly do that line better than Richard Burton? 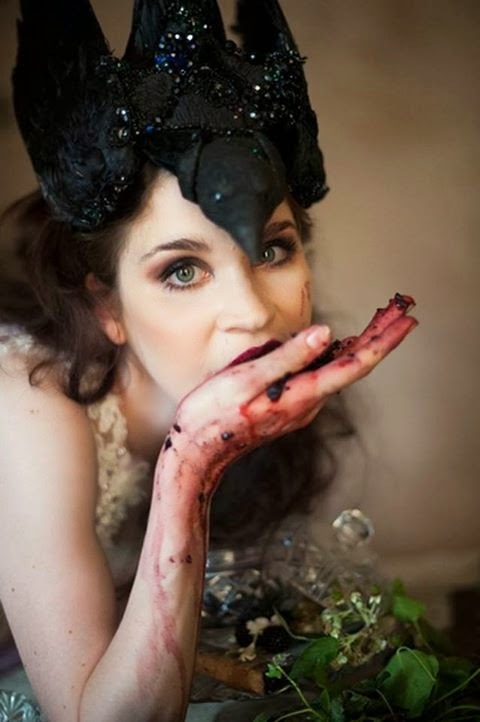 The e-mail pinged and lo “A girl mad as birds bolting the night of the door with her arm her plume.” I was thrilled! The line meant nothing to me, I had never heard or read it before but birds and madness? How wonderful! 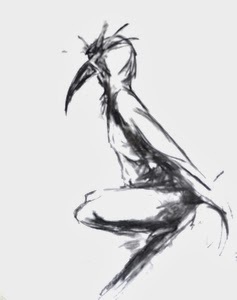 I have always been fascinated with the connection between birds and insanity and I’m not alone, our language is littered with references to bird like behaviour, cloud cuckoo land, bird brain, all of a twitter. Currently I love the work of Ellsewhere and Suzy Sharpe and this line of poetry made me realise that I have always loved this type of imagery so I tried to trace it back. I thought I had found the root with Angela Carter’s mesmerising Fevvers, the protagonist in Nights at the Circle but no, I read Poe’s Raven before that, however even before that old sage, I grew up listening to the tales of Baba Yaga and her hut that moved on chicken’s legs. But maybe it’s more fundamental than that, quite simply who hasn’t looked at a bird and wished that they to could fly. Escape, soar, loop the loop (not sure how many birds loop the loop but I would). Anyway, thrilled, I went to seek out the poem to get a better grip on the sentence, the e-mail appeared to have failed to send over the right amount of commas. Now it seems the Dylan and I have something in common, whilst we both know that grammar is a useful thing, our teachers told us so, we often forget to use it. In fact Mr Thomas is well known for his grammatical laissez faire. I wish I had known him in school, I might have tried to plead Dylan Thomas when my red scrawled homeworks were returned to me. So whilst I was sympathetic to him, I was a bit stuck as to how I should read this poem. This is how it is laid out. Right then, A girl mad as birds – easy, rat ta ta tat. Love it. Next? Bolting the night of the door with her arm her plume. Huh? OK So not only do I not understand it, I don’t understand it even if I try to put commas in. Who is bolting the night, the girl or the birds? I could cope with that ambiguity if there was a full stop after night but there isn’t, it’s night of the door. What is the night of the door? The door of the night makes more sense. Moving on, if we ignore night, I can understand bolting a door with an arm but her plume? A birds wing? Water? A head dress? I am envisaging a pale white arm thrown up to throw the bolt at the top of an oak door. So; A girl, mad, as birds bolting the night of the door, with her arm her plume. or A girl, mad as birds, bolting the night of the door with her arm, her plume. or any other variety of randomly strewn commas. Hmm. Despite this unexpected challenge I downloaded the Vine software and me and my son tried to film 6 seconds. At this point can I just say bravo to all the directors out there, and the sound engineers, the lighting gaffa, even the best boy. It took Thomas and I over half an hour and we still didn’t get it right but rain stopped play. I wanted the shot to look a little dishevelled and arty (I got scruffy school girl project) but transferring what is in your head onto a screen is sooo hard. We had some great ideas including throwing feathers in the air, this was great fun and included stabbing a pillow and a lot of laughter, I also tried to make my clothes look messed up but Thomas though I looked like a prozzie – his words. Take, after take, after take 🙂 Finally we gave in and figured that something had to be right. Only to discover that we hadn’t actually saved any of the shots! Dear god. Back to fumbled lines – could not get door and night in the right order, swinging lights, dying batteries, backcombed hair, chewed off lipstick, so it went on until finally the rain put us out of our misery. Actually we had had a hell of a lot of fun doing it and although the finished item is not what I wanted, the project was great fun and in my mind total success. Below is the clip that Thomas and I decided on. When the whole poem is stitched together I’ll add that link as well. God just realised that I may have messed up other people’s efforts by screwing mine up and reading it all wrong. Bugger. I do hope I’m surrounded by fun loving, amateur, idiots, not actual clever artists. Still I’ll make them look good. Bravo Dylan, you mad old bugger. When isotonic drinks are REALLY bad for you! It all started my my dentist peering into my son’s mouth and then asking me how many fizzy drinks he had. None, well maybe one a fortnight? Hmm, fruit juice? Nope. 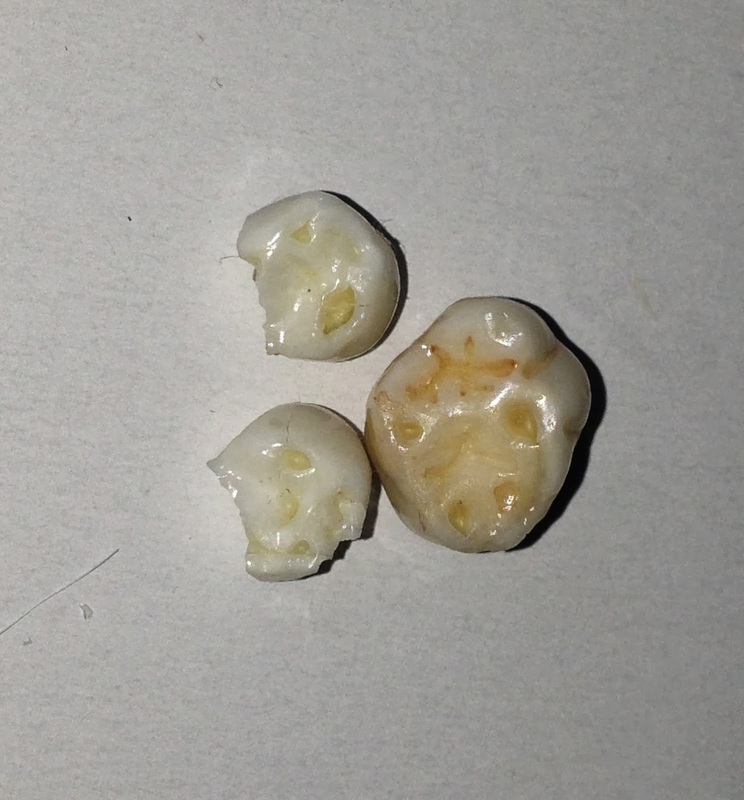 The dentist’s concerns were that Finn’s teeth were showing considerable acid erosion, this is something different to decay caused by sugar. She was concerned but told us to keep an eye on things for the next six months. Six months past and the next conversation went along the lines of “Are you sure?? ?” In fact the erosion was so severe that Bridget gave us some litmus strips to test everything he was drinking. If it wasn’t in his intake it might be stomach acid. The small little indents are caused by acid erosion. So we came home and tested one of his milkshake drinks – no problems, we then tested one of his sports drink. Off the scale! Instantly the paper went bright orange indicating high acidity.Everything fell into place really quickly, Finn drinks loads of these but they’re not fizzy and not particularly sweet so I hadn’t really thought of them. What were the pH levels of sport drinks? I was only interested in sports drinks, although I also added a fizzy drink, a fruit juice and an energy drink as bench marks. All drinks were to be tested as soon as the bottle was opened. The pH stick would be rinsed in distilled water after each test. All drinks were done at the same time at room temperature. I wasn’t sure if the composition of the drink altered after a few hours enough to change pH levels but decided not to risk it and did them all at the same time. So citric acid is a massive culprit and if it appears in the top 4 list of ingredients you can guarantee your drink is going to be too acidic. If sugar / syrup is in the top 4 list of ingredients you have given the acid something with which to glue itself to your teeth. Hmm. If you’re an athlete that wears a gum shields think about how you use it. Typically you will have a slug of your drink and then replace your gum shield. This effectively locks the acid liquid against the teeth. A further problem for athletes is that due to their performance and exertion there is a lack of saliva in the mouth and it’s saliva that washes away sugars and bacteria from the mouth. Replacing saliva with a sugary, acidic drink is a bad swap. I’d like to test a further range of products including energy drinks and sport gels. There also needs to be research into the effects of gumshields on teeth when used with isotonic drinks. This article has not been peer reviewed unless Facebook and some likes from friends count! 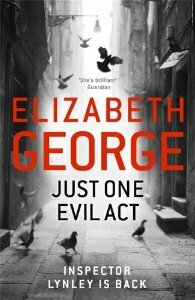 Just One Evil Act – Elizabeth George. Oh woe unto the reader whose favourite author becomes a best-seller. Elizabeth George is a wonderful author, she spins exciting whodunits with great twists and turns, peopled with fabulous stand out characters but recently she seems to have developed itchy feet. Ever since the death of Helen, George seems to have grown frustrated with her series. You can hardly blame an author for wanting to branch out and try something new and I wish she would. I would love to read it but the last few Lynley books have been long winded, convoluted and not very thrilling. In “Just One Evil Act” the story continues from the end of the previous novel with the kidnapping of Hadiyyah. This novel is mainly set in Italy, focuses on Barbara Havers and is 700 pages long. It is full of interesting side characters and Italian phrases, which are constantly followed by a translation, and deliberate misunderstandings which all result in a very, very slow read. If you love Elizabeth George novels because you really get into the characters and their lives then you will love this but if you love her for her tightly knit crime stories then this isn’t the one for you. Despite a recent TV series, the Wars of the Roses has been generally overlooked, the most anyone knows about this period of history is via Shakespeare and his interpretation of a hunchback Richard III and the death of the Princes in the Tower. Given how violent and exciting this time actually was, it is amazing that it is constantly overshadowed by the Tudors. So who better to reveal the dynastic murderous feuds than the man who brought the Mongol and Roman empires to life? 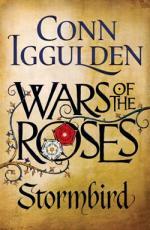 Conn Iggulden starts his series with the marriage of Margaret to King Henry IV, his sympathies clearly lie with the young Queen, uprooted and cast into a foreign court and wed to a man who is clearly very ill both mentally and physically. With no direct heir, factions of the court are determined to try and install a protectorate. The most powerful of these is led by Richard, Duke of York who himself has a strong claim to the throne, he is supported by his wife Cecily who is painted in the cruellest of shades and makes for a fabulous villain. Given how many twists and turns there are in this period of history it is hard to see if Iggulden will remain on one side throughout the series but at the moment he is clearly flying the Lancastrian flag. The pace of this book is gripping and never bogged down by historical details. Although generally accurate the author takes artistic license to move the story along when required and obviously adds his own interpretation to the motives and personalities of the principle characters. Sometimes historical fiction can become too bloated by the author’s need to show off all that they have researched. Iggulden just uses that knowledge to underpin his story but not get in the way of it as it tears through at a death or glory rate!